Sorry, I know it has been a while again, safe to say we are starting to feel very settled in our new Australian lives and slowly, now that the house and the job are sorted, I am starting to have the time to blog again. 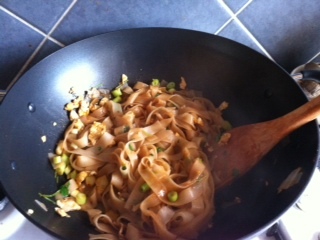 This recipe is one which I found on the amazing Budget Bytes website and which I have tweaked slightly for ease of finding the ingredients in Australia, this really is a fantastic veggie recipe though for quick and easy noodles which are very tasty indeed and evoke the spirit of a quick and dirty phad thai. I cook this all the time now, it is our go-to Saturday lunch and I can knock it out in around 15 minutes so it has quickly become a favourite in our house. And what you do is: cook the noodles for the necessary 6/7 minutes and while they are boiling mix the sugar, hot sauce and soy sauce together into a sauce (I always dip a finger and adjust to taste, usually adding a further small amount of sugar or soy), put this to one side and chop your spring onions and coriander ready for use later. By now your noodles should be done so drain them and heat your wok or a large pan with a splash of oil (orig recipe uses butter but I am trying to lessen the calories a little), add your chilli flakes and heat until the oil is hot then drop in your beaten egg and LEAVE IT ALONE for about 30 seconds. At this stage you should give it a stir to break it up into nice chunks. Turn the heat down and chuck in your noodles and then immediately add the sauce and stir it all together until the noodles are coated. Whack in the spring onions and coriander, give it another stir and bob's your uncle. Very tasty noodles. I then add a bit of lime juice and also some chopped nuts if I have them (I didn't in the below pictures but it further enhances the phad thai feel). In terms of health, each portion, based on the above ingredients, is around 460 calories and 3.7g of sat fat (11.5g overall), 88.7g of carbs (as calculated by Myfitnesspal).